The conformations of glycans are crucial for their biological functions. 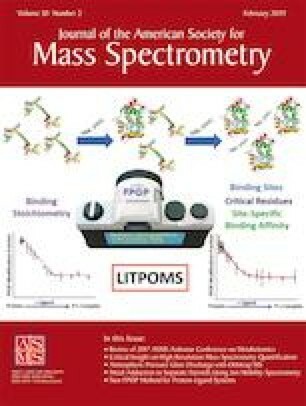 In-electrospray ionization (ESI) hydrogen/deuterium exchange-mass spectrometry (HDX-MS) is a promising technique for studying carbohydrate conformations since rapidly exchanging functional groups, e.g., hydroxyls, can be labeled on the timeframe of ESI. However, regular application of in-ESI HDX to characterize carbohydrates requires further analysis of the in-ESI HDX methodology. For instance, in this method, HDX occurs concurrently to the analyte transitioning from solution to gas-phase ions. Therefore, there is a possibility of sampling both gas-phase and solution-phase conformations of the analyte. Herein, we differentiate in-ESI HDX of metal-adducted carbohydrates from gas-phase HDX and illustrate that this method analyzes solvated species. We also systematically examine the effects of ESI parameters, including spray solvent composition, auxiliary gas flow rate, sheath gas flow rate, sample infusion rate, sample concentration, and spray voltage, and discuss their effects on in-ESI HDX. Further, we model the structural changes of a trisaccharide, melezitose, and its intramolecular and intermolecular hydrogen bonding in solvents with different compositions of methanol and water. These molecular dynamic simulations support our experimental results and illustrate how an individual ESI parameter can alter the conformations we sample by in-ESI HDX. In total, this work illustrates how the fundamental processes of ESI alter the magnitude of HDX for carbohydrates and suggest parameters that should be considered and/or optimized prior to performing experiments with this in-ESI HDX technique. The online version of this article ( https://doi.org/10.1007/s13361-018-2080-1) contains supplementary material, which is available to authorized users. O.T.L. and E.S.G. were supported by The Welch Foundation under award number AA-1899. M.R.B. and T.S. were supported by NSF IDBR award number 1455668. E.I.C. and K.L.S. were supported by the Chemical Sciences, Geosciences, and Biosciences Division, Office of Basic Energy Sciences, Office of Science, U.S. Department of Energy under Award Number DE-SC0019327. We thank the Baylor Mass Spectrometry Center (MSC) for providing instruments and resources used to collect the data presented here. We thank Baylor University’s High Performance and Research Computing Services (HPRCS) for technical support and access to the cluster (Kodiak). We thank H. Jamie Kim and Ian G. M. Anthony for assistance with solution-phase HDX experiments and data presentation software, respectively.